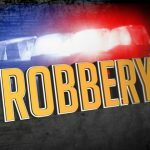 Roanoke County police responded to the Country Store on Starkey Road for reports of a robbery this morning. Callers say a white man with blonde hair entered the store wearing a dark gray sweatshirt and gray sweatpants. He demanded money from the clerk and fled the scene just before 3 am. No arrests have been made and anyone with information is asked to call the Roanoke County Police Department. From news release: On Friday, July 13, 2018 at approximately 02:40 AM, Roanoke County Police Officers responded to the Country Store in the 4700 block of Starkey Road in reference to a robbery. Information was received that a white male entered the store wearing a dark gray sweatshirt and gray sweatpants. The suspect was described to have blonde hair. The suspect demanded money from the clerk and subsequently fled the scene with an unknown amount of assorted U.S. currency. No arrests have been made and anyone with additional information about this crime is asked to call the Roanoke County Police Department at (540) 562-3265.